You know, not all classic games need to be restored for current-generation consoles. Just because something was deemed popular years and year ago doesn’t mean it will find a great deal of success (or play well) in today’s world. We’ve seen many attempts to revive hits like Sonic, Duke Nukem and Wolfenstein in the past, and in most cases, the results didn’t do justice to their respective franchises. The first portion of Bethesda’s presentation had my full attention. A cinematic sequence showing B.J. sneaking across a heavily guarded Nazi train introduced interesting characters, detailed facial animations and a tension-rich discussion with a high-ranking German soldier. The Nazi officer held a gun to our in-disguise hero as she whimsically tested his Aryan purity, never wiping the unsettling smile from her face. It was a deliberately uncomfortable scene, but one that had my eyes locked onto the screen. The personality of The New Order continued to peak through as B.J. traveled to a cabin where his female alley took residence and moved toward an intimate moment with her. At the time, I really began to believe in this new take on the simplistic Wolfenstein that we’ve seen before. However, the second half of our private show focused solely on the destructive armaments and grandiose violence that we’ve all come to expect. Nazis were dismembered and dealt with via thousands of shells shot through the rifles and launchers B.J. carried, and there were even a few up-close-and-personal encounters that required the use of dual shotguns. It was loud and proud, which for many people, is just enough to drag them through eight hours of campaign levels. But once I actually got my hands on the playable version, it was evident that the majority of The New Order is the same shooting we get in dozens of other popular titles on the market, set in uncomfortably tight environments. Nothing about blowing through the herds of angry Nazis feels broken or clunky, but sadly, it just seems boring. The blistering pace seen throughout the lengthy demo serves to numb the moment-to-moment action, only making me pine for more of the interesting conversational elements the developers had already shown off. Don’t take this as me completely writing off MachineGames’ work. 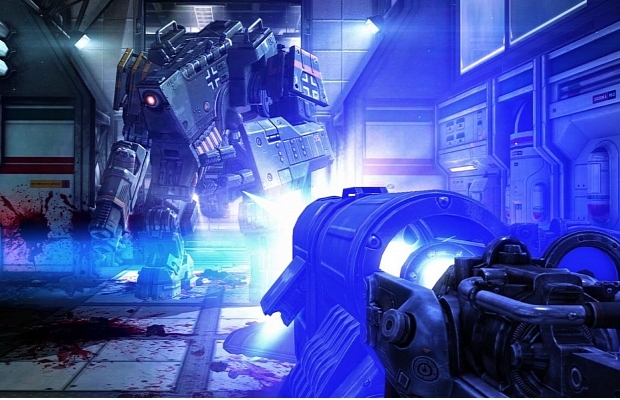 I think Wolfenstein: The New Order will be just fine, and I bet plenty of people will find some enjoyment in it. If it happens to smartly balance the wearisome action with the fascinating narrative sequences, this could be a strong revival for the franchise. However, actually playing the game left me feeling uninterested in slogging through the final product, and that’s worrisome. I would love to be proved wrong, but we’ll just have to see how it all pans out when the game launches on both current and next-generation platforms later this year.